Bordeleau Park, which follows a fun day shooting in the park while we were tormented by a biplane. High Jinx Basement where Sue describes one of the tools we use. Cast Interview, talking to Dina Elleithy, Emanuelle, Carriere, and Orrin Kerr on our day of shooting at Highjinx. Interview with the Wardrobe and Makeup supervisor, Tracey “Halyma” Vibert. 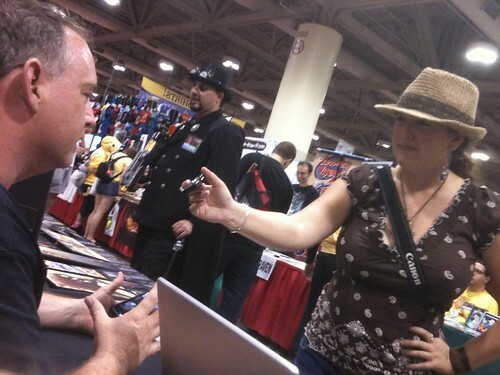 And here’s a photo of Greg and (off-camera) Tom being interviewed by The Avod at FanExpo this weekend.